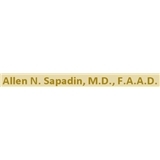 Allen N. Sapadin, M.D., F.A.A.D. (Hackensack) - Book Appointment Online! Allen N. Sapadin, M.D., F.A.A.D. The office of Dr. Allen N. Sapadin is a state of the art facility located in the heart of Hackensack. Our office is dedicated to meeting all of our patient's dermatologic needs. Brief. To the point. In and out meeting. Answered all my questions.